3. 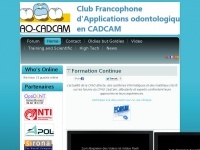 Abstracts of CFAO Cad­cam Sympo­sium 2011 /index.php?option=com_con­tent&view=ar­ticle&id=53&Itemid=113..
4. Abstracts of CFAO Cad­cam Sympo­sium 2012 /index.php?option=com_con­tent&view=ar­ticle&id=52&Itemid=114..
5. Résumés Imagi­na Den­tal 2013 /index.php?option=com_con­tent&view=ar­ticle&id=92&Itemid=144..
6. PAG Den­tal prepara­tion /index.php?option=com_con­tent&view=ar­ticle&id=61&Itemid=103..
7. PAG An­te­rior crown /index.php?option=com_con­tent&view=ar­ticle&id=73&Itemid=120..
8. Den­tal prepara­tion V-Prep En­doV-prep /index.php?option=com_con­tent&view=ar­ticle&id=75&Itemid=122..
9. PAG Poste­rior crown /index.php?option=com_con­tent&view=ar­ticle&id=74&Itemid=121.. The web server used by Cfao-cadcam.net is located in Road Town, Virgin Islands, British and is run by Confluence Networks. There are many websites run by this web server. The operator uses this server for many hosting clients. In total there are at least 14,423 websites on this server. The language of these websites is mostly english. A Apache server hosts the websites of Cfao-cadcam.net. The website prohibits search engines and webcrawlers archiving the website. Other actions by webcrawlers and bots are allowed.